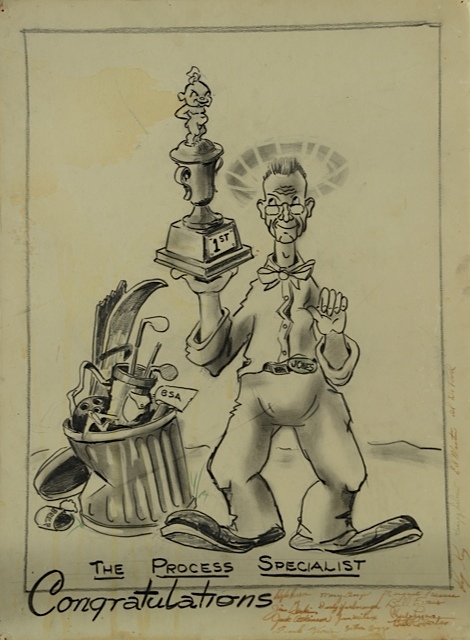 When I was born, my father’s colleagues congratulated him with the cartoon below. One of the hardest things about having kids is the loss of identity. Parents often feel that they have to give up their recreational pursuits because children demand all their time. But is this necessary? In fact, parents today spend much more time with their kids than they did in previous generations. Fathers spend twice as much time in child-oriented activities than they did in 1965, and mothers spend an average of 20 percent more time with their kids. Where does this extra time come from, and what is sacrificed? Generally, when both parents work outside the home, that extra time has come from mothers dropping some housework chores since 1965, and dads picking some up. But most of the additional child-oriented time has come at the expense of time spent with partner, friends, and on personal interests. Think of your relationship as a Venn diagram composed of two circles, one for each partner. The circles overlap for couple time—date night, activities together, time alone together. If you have children, add a third circle for kid-oriented or family time. 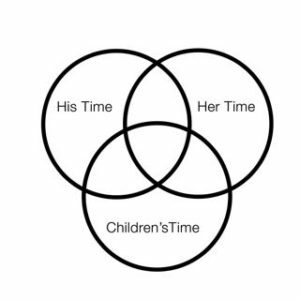 Depending on the ages of your children, that circle will be larger at some times than others, but the important thing is to have your own circle, large enough to have time for individual pursuits not involving your partner or the kids. This was what my dad threw away. He trashed all those fun activities to support his family. For him, as for so many men of his generation, ”support” did not mean participating in child-oriented time; it meant working. In my parents’ conventional marriage, he was the wage earner and provider: so much so that by the time his cancer was diagnosed, he had accrued three years of sick time. Which was just the exact amount of time he used before he died. Don’t make that mistake. Give yourself permission to pursue your passions (within reason; maybe not 18 holes of golf every weekend, as this will surely cause conflict in the marriage) and reclaim the things you loved doing before kids or find new interests that nourish you. Don’t give up friendships. Friends are good for marriage because marriage doesn’t have to meet our every need. Friends also spread the load of stress so the marriage doesn’t have to bear it all. Express your needs for support and negotiate compromises. Fairness in distributing chores and caregiving tasks will reduce stress in your relationship. Read my post about the division of labor in marriage. Make time for fun together. Having enough fun strengthens your relationship and protects it during hard times. A good rule of thumb is to schedule two dates a week, where you get a sitter, a friend, relative, or neighbor to watch the kids and you go out for coffee, a walk, or dinner. Try to make it new and invent different activities to do together. In Gottman’s work, this would be called turning toward each other. I agree that the Venn diagram of marriage needs the flexibility to change even for people without children, as work and other demands change– like aging parents. Thanks. Your father is one of those fathers– he must be so proud of you for he raised a precious child that helps others! For you are touching and educating a need of most all of us yet until to late I’ve always said couples should take mandatory class before marriage. IM happy know my children our going to exposed to knowledgable, caring people as yourself your’e precious and your father loves you SO!SO!SO! MUCH! THANK YOU! GOD BLESS YOU AND YOUR FAMILY! Tony, Thank you for such a warm comment. I appreciate you taking the time to mention my father. I do wish he had not died when I was so young, but your comment — I take it to heart. this is a wonderful post. I especially love the cartoon. It says so much about what we give up but your thoughts make me rethink those decisions. I agree with all you have said, but what do you do when you don’t have anyone to help out with your child to have date nights, or anytime alone for that matter? It’s crazy because I never thought my parents nor my in-laws would hardly ever ask to have our daughter slumber or come play very often at all. Although I didn’t know my dad would get diagnosed with cancer, have treatments and thankfully by Gods Grace beat it, and he actually is the only one to keep her the most. Still weak and not in the best of health because of an accident at work prior to the cancer, yet he will do it most times I ask! My mom will still get off work and take a nap though instead of spending time with my daughter or help my dad with her. And right now I’m needing a lot if time to study for my NCLEX to become a Nurse, and still nobody helps like I thought they would. It has hurt our marriage a lot, and I just want to feel our love and passion for each other again. But I’m out of options except during school season from 8-3 each day which my husband wrks all week so that doesn’t help us much. Tristan, Thank you for sharing your experience here. You describe a very real situation and one that needs to be worked with in an on-going way. Your desire to nurture your marriage is healthy and admirable given the stresses now. Grandparents are not universally helpful with grandkids. Some are, some are not. Discuss all this with your husband. The most challenging thing is when couples let too much time pass without trying to work on intimacy. The first step is to talk about your needs, and together find ways to get time together. Play-date trades with friends and neighbors is sometimes a good option.